Established in 2002, Humana Cortex Consultant Group has grown to include experts in diverse fields and countries. With key partners throughout the Americas and Europe, our team is ready to deliver the results you need, when and where you need them. While the United States is wondering what will happen next on climate change mitigation in their country, both India and China have recently unveiled very ambitious plans to fight local air pollution and global climate change. The Guardian goes on to list how India could become a renewable energy super power in the next decade or so, as investments in the area are booming. From bringing electricity to 400 million people with solar energy to going LED or investing massively in renewables, India has been showing strong leadership in this most important issue for a few years now. To the point that, according to newspapers, renewable energy investments in India to reach $250 billion over next five years, and over a trillion by 2030. In neighbouring China, the government has announced a plan that it will spend $360 billion on clean energy sources by 2020. This will result in the creation of 13 million jobs and cut significantly the amount of air pollution in Beijing and other Chinese cities. Meanwhile, Beijing has announced that it will be closing and/or not building another 104 coal-fired plants that were either due to be constructed soon or were being constructed. This move is significant – 120 Gigawatts of capacity – as it is equal to a third of the amounts of coal-fired plants in the United States. China installed over 34 Gigawatts of solar PV capacity in 2016 alone as Cleantechnica reported, with over 11 GW in one month alone. This is absolutely staggering as it brings the total solar PV capacity of the country to 77 GW. Yes, capacity almost doubled in one year. All this can be explained by the fact that renewables are getting more and more competitive every day and that smart countries invest in cost effective and low carbon solutions. In early 1996, the global solar PV capacity was of 200 MW, now the world installs that capacity every single day… Let that sink in. And it probably will not stop anytime soon as to Bloomberg New Energy Finance, solar is now becoming even cheaper than wind. Leading the surge is China, which already has a huge advantage in its current position at the front of the pack. China has not only vastly expanded its domestic investment in renewable energy, it is plowing record sums into renewables markets overseas. As our report noted, China put $32 billion into foreign renewables projects in 2016 alone, and last week it said it would increase its bets on renewables by tenfold around the world before the end of 2020. That increased bet is likely to expand China’s renewable-energy employment base beyond its current 3.5 million level. Of note on this point: employment growth in renewables is in sharp contrast to massive worldwide layoffs in the oil, gas and coal industries. Its domestic renewables push has given China priceless experience ahead of other nations, allowed it to develop leading-edge technology, educated a large, supporting labor force and created financial mechanisms to pay for the expansion. Now China is exporting its renewables juggernaut, taking stakes in projects of note elsewhere in Asia and in Africa, Europe, India, North America and South America. We think the global boom in renewables will last for decades, driven not just by Chinese investment but by other emerging economies—and by industrialized ones as well. Growth in solar, wind and energy-efficiency initiatives are steadily reducing the costs of production and making renewable energy cheaper than traditional sources. Public pressure to combat pollution and build collective action on global climate change is growing. These are huge combined market forces that as we speak are shaping how electricity production, especially, is being reimagined. In the fast-moving renewables revolution, economies as diverse as those of Bangladesh, Brazil, Chile, Indonesia, Kosovo, Mexico, the Philippines, Puerto Rico, and South Africa now have the means to foster prosperity without imposing harsh consequences on public health and the environment. Meantime in the U.S., national energy-policy discussions are drifting the other way as an evidently over-the-hill gang takes power in Washington with hopes of going back in time to when companies like Exxon mattered more than they do now and when economic growth was driven by fossil-fuel consumption. Those days are done, though, and so are the days when solar- and wind-powered energy were dismissed by skeptics as sci-fi experiments or “alternative” sources to traditional fossil-fuel generation. There’s no turning the clock back. Clean energy has gone mainstream. Wind and Solar Costs Are Plummeting: Now What Do We Do? For years, debates about how to reduce carbon emissions from electricity generation were framed as trade-offs: What is the cost premium we must pay for generating zero-carbon electricity compared to fossil fuels, and how can we minimize those costs? Fortunately, the holidays came early this year for renewable energy: In investment company Lazard’s annual report on the levelized cost of energy (LCOE) for different electricity-generating technologies, renewables are now the cheapest available sources of electricity. This flips the question of clean-versus-cost on its head. And in 2017, we’ll be asking: How much can we save by accelerating the renewable energy transition? The story from Lazard’s 10th annual report is clear. Rapid technology cost reductions mean wind and solar are now the cheapest form of generation in many places around the country, without federal subsidies like tax credits. 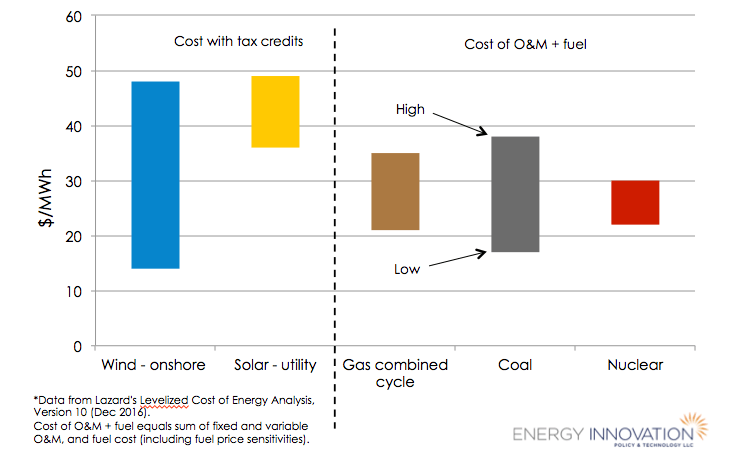 What does levelized cost of energy mean? 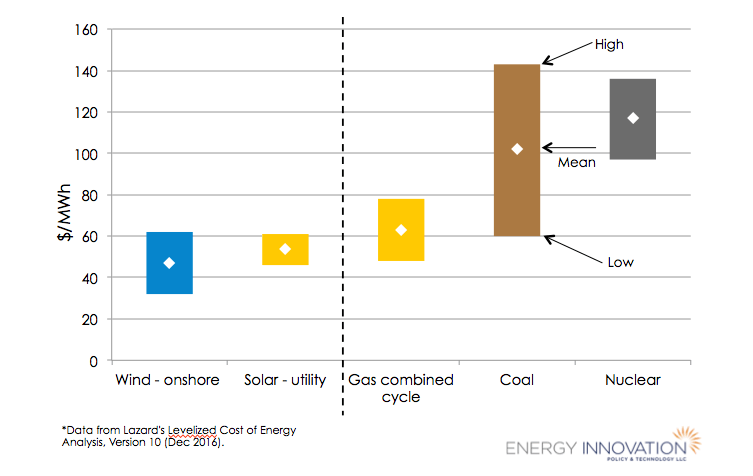 Lazard uses LCOE analysis to identify how much each unit of electricity (measured in megawatt-hours or MWh) costs to generate over the lifetime of any power plant. LCOE represents every cost component – capital expenditure to build, operations and maintenance, and fuel costs to run – spread out over the total megawatt-hours generated during the power plant’s lifetime. Because different plants have different operating characteristics and cost components, LCOE allows us to fairly compare different technologies. Think of it as finally being able to evenly compare apples to oranges. 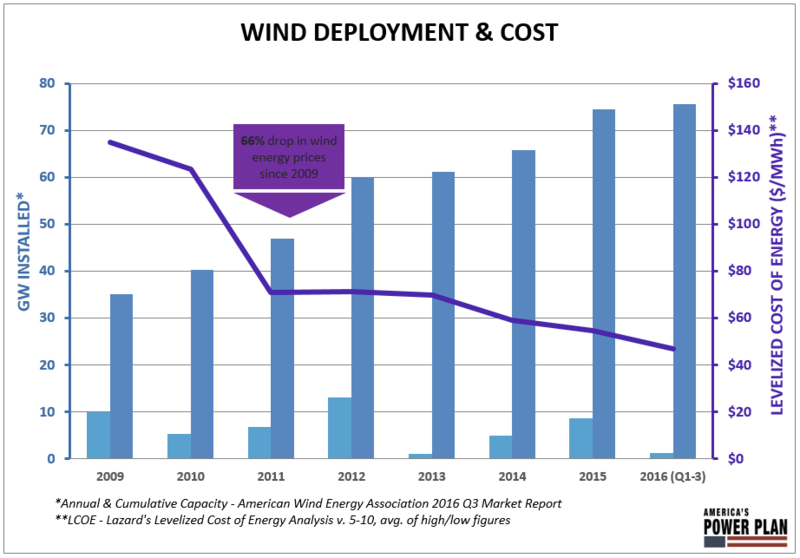 According to Lazard, wind costs have fallen 66 percent since 2009, from $140/MWh to $47/MWh. 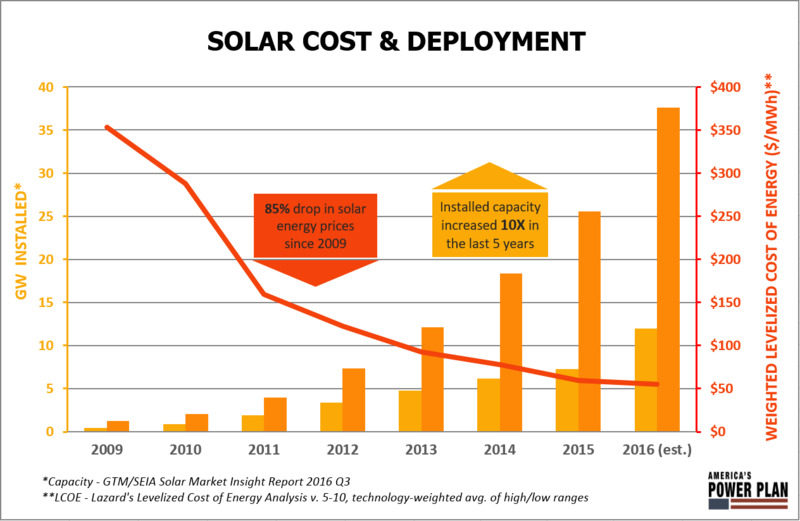 Large-scale solar’s cost declines are even more dramatic, falling 85 percent since 2009 from more than $350/MWh to $55/MWh. The case is even clearer when federal subsidies are considered: Tax credits drive renewable energy costs down to $31/MWh for wind and $43/MWh for solar. These low prices are not only cheaper than building new natural gas plants, but they are also cheaper than many fossil fuel power plants on their marginal cost (i.e. costs for operating, maintaining, fueling, etc.) alone. Even with these new numbers, more natural gas plants are being built every week, expensive coal is not retiring as fast as economics would dictate, and the rapid transition to renewable energy isn’t happening fast enough to prevent the worst effects of climate change. While just wind and solar alone could potentially power the entire U.S. many times over, the windiest and sunniest (and thus cheapest) places to generate wind and solar power are often in remote locations, far from large cities with lots of power demand. Costly, drawn-out processes for siting transmission and power plants make these projects unnecessarily expensive and stifle investment. Policymakers can turn to America’s Power Plan for recommendations on streamlining the siting process and limit local impacts to create policy that reduces siting costs for renewables in the U.S. Managing America’s grid with variable renewables also requires rethinking how we operate and plan our electricity systems, and many utilities have been slow to adapt. Grid operators sometimes claim we need to back up solar and wind an equal ratio of fossil fuel power plants like coal or gas for “when the sun doesn’t shine and the wind doesn’t blow,” but that’s just not true. Adding wind and solar can reduce the risk of a large outage – what are the odds the wind unexpectedly stops blowing everywhere or the sun is suddenly blotted out by clouds everywhere? In fact, government analysis shows we could quadruple the amount of wind and solar on the grid today without running into reliability issues. Besides reliability, defenders of the old paradigm of large, fuel-fired power plants argue wind and solar come with integration costs, i.e. backup generation and transmission lines to connect remote locations to the grid. But attributing these costs to any one technology makes little sense across a big grid, where a diverse mix of power generation naturally smooths variability like an index fund versus a single volatile stock, for example. Gas, coal and nuclear power also require new transmission, fuel supply and storage, and large backup reserves. Like renewable sources, they also have “integration costs,” even without accounting for the health and climate costs of carbon dioxide and other pollution. Transitioning our electricity sector away from fossil fuels is no longer just an environmental imperative; it’s an economic one. Free markets now favor solar and wind — look no further than gas-rich Texas for evidence: Texas has over three times more wind capacity than any other state, and solar is expected to grow 400 percent by 2022. Outdated policies leave us unprepared to take full advantage of the rapid cost declines we’re seeing in the wind and solar industry. The time is now to radically adjust for a paradigm where wind and solar form the backbone of our electricity grid. Strategically located throughout the hemisphere, our specialists are at your service!